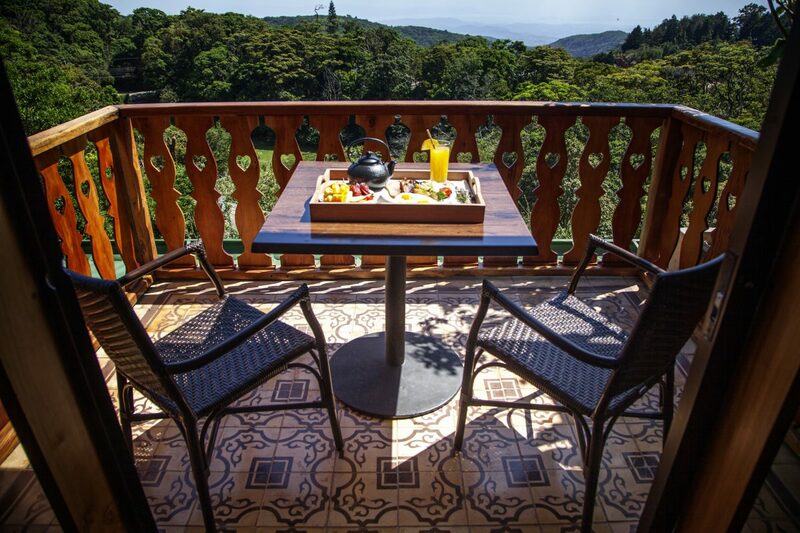 Our Peninsula Rooms are located on the lower floor of the hotel. 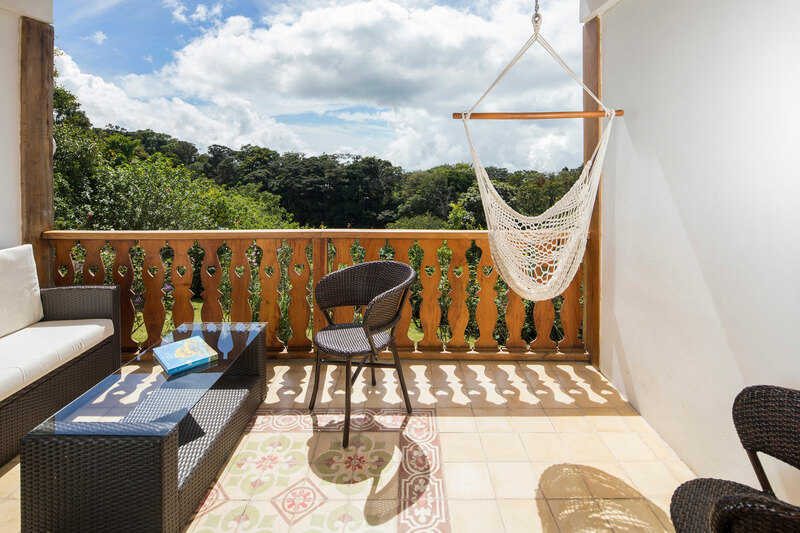 Equipped with two queen size beds and a large terrace with outdoor seating, a hammock, and partial views of the Nicoya Peninsula and our vast gardens. 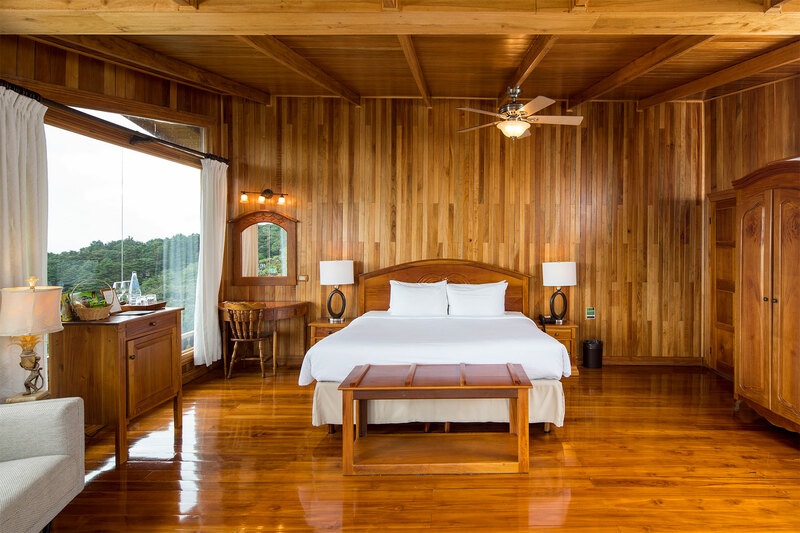 Although the temperature in Monteverde is usually quite pleasant, all Peninsula Rooms also have a ceiling fan for added comfort. Peninsula Superior Rooms are located on the top floor of the Main Building. 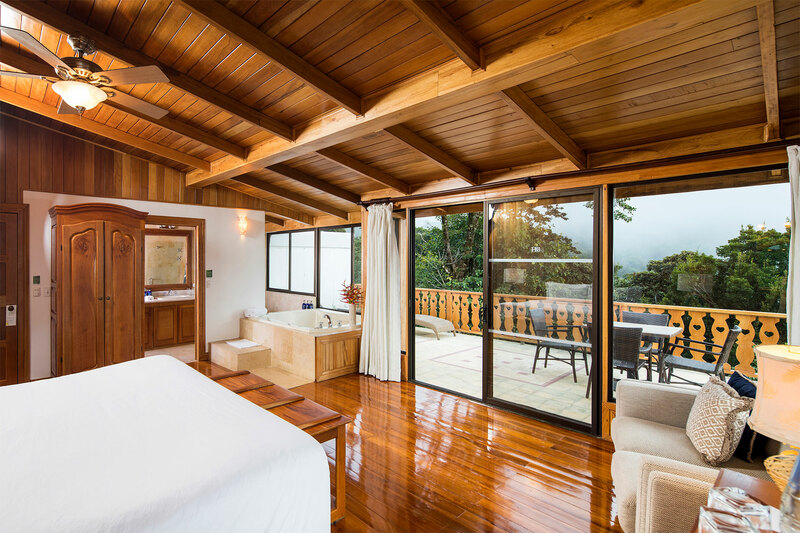 These rooms are ideal for couples, with private comfortable balconies with views of the Nicoya Peninsula and an open bathroom concept. 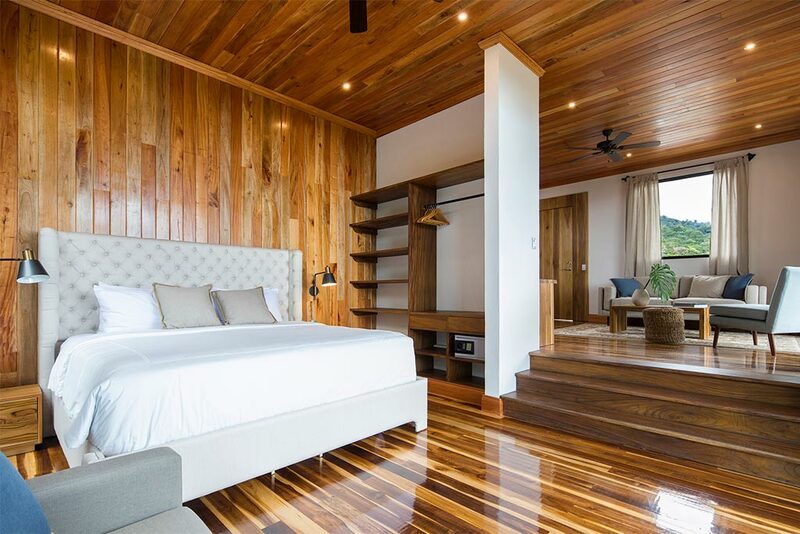 All rooms have a king size bed. 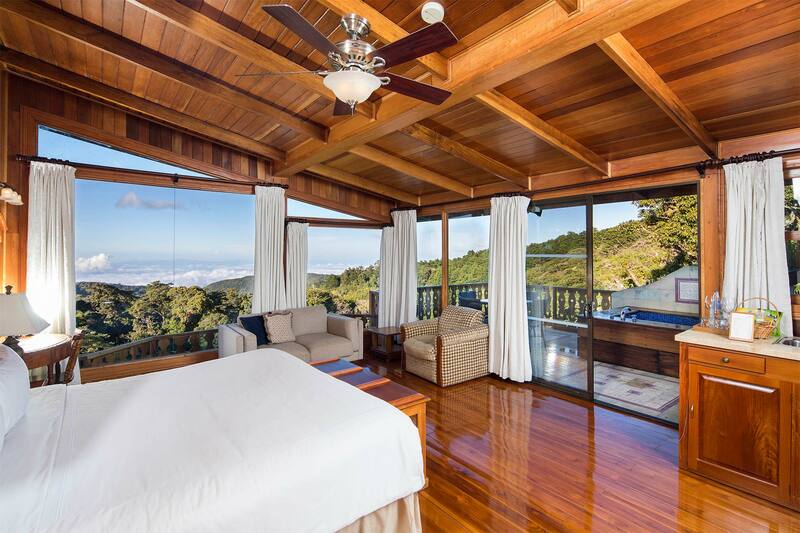 This room features floor to ceiling windows surrounded by stunning views of the cloud forest. 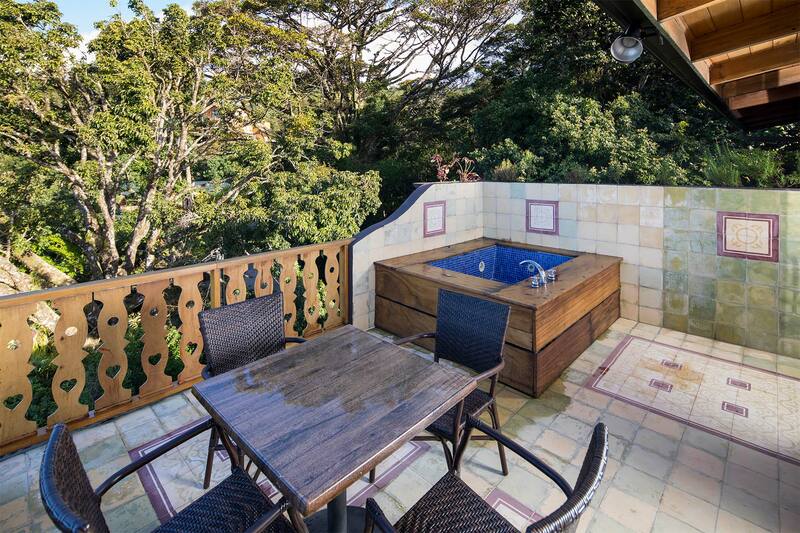 Enjoy also a glass enclosed Jacuzzi, a balcony and an ample living area. Available with one king size bed or option to add a full size additional bed. A great alternative for friends or family. 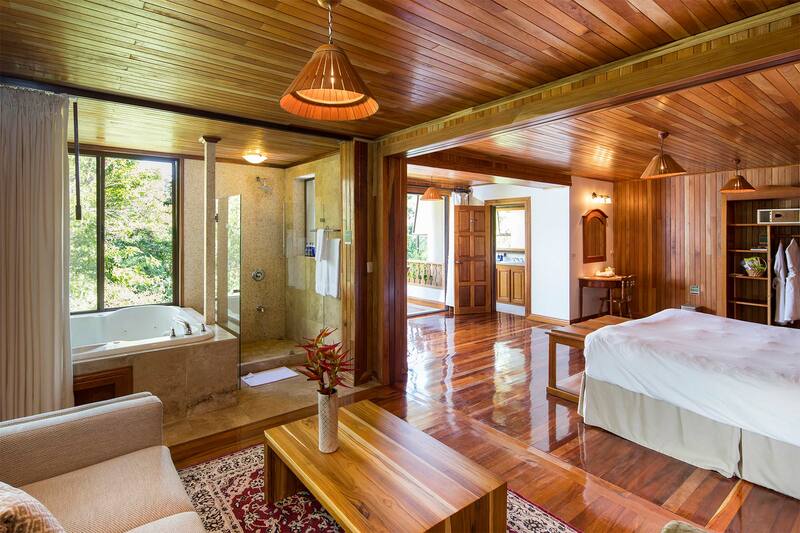 Equipped with a king size bed and a shower. 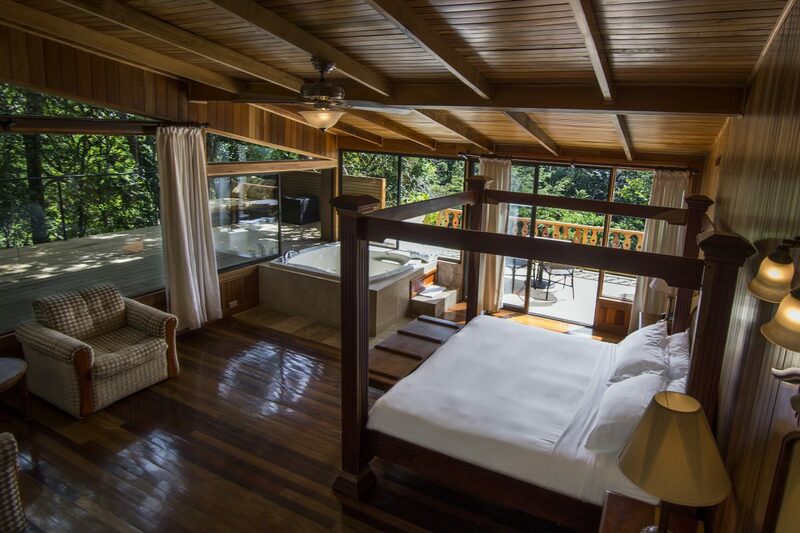 Located in the top floor of the Chalet, the Canopy Room is surrounded by all the wildlife of the Monteverde forests. 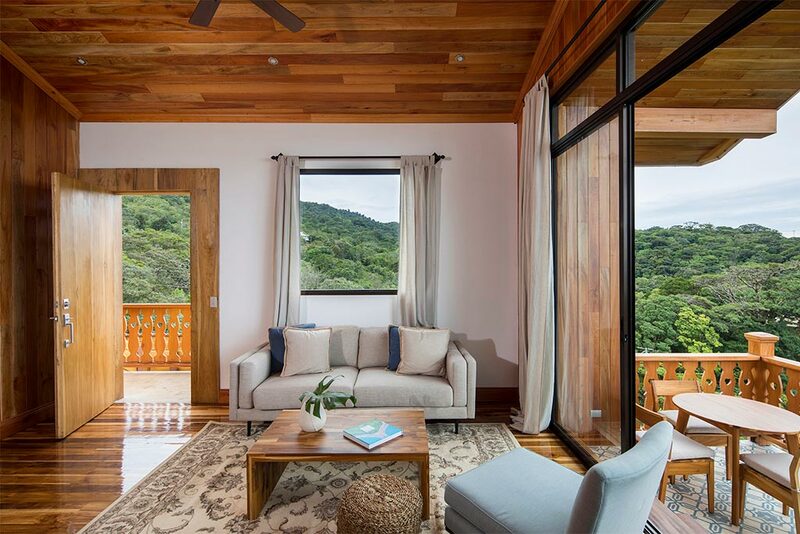 Featuring floor-to-ceiling windows inches away from the trees and a large terraces overlooking the mountains of the Monteverde Cloud Forest Preserve, our Canopy Rooms will make you feel at one with nature. 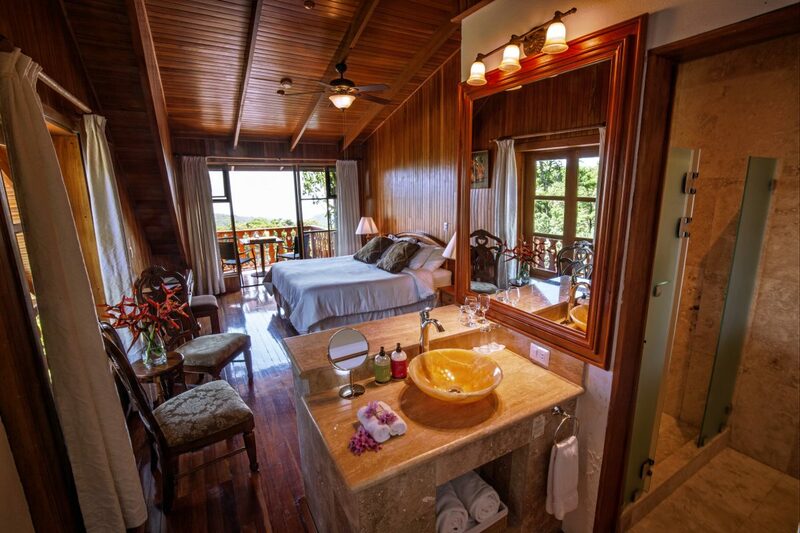 Equipped with a private whirlpool Jacuzzi, a king size bed and a shower with forest views. 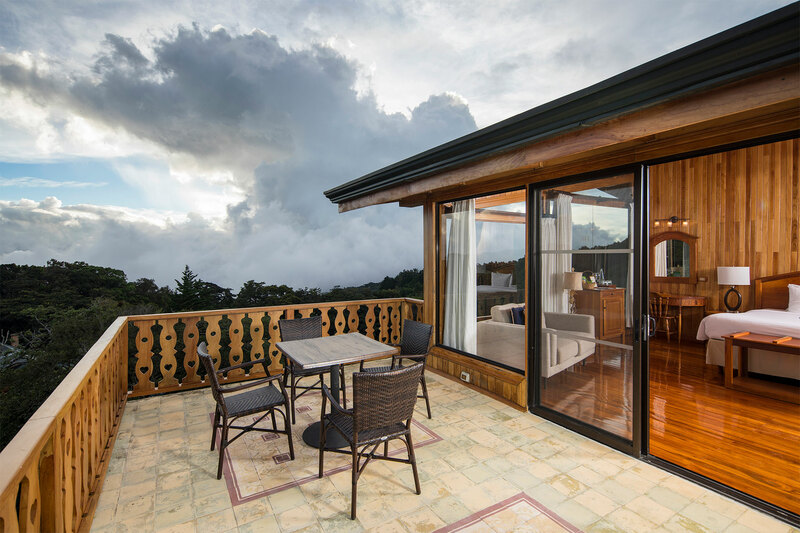 Featuring our very best views of the Pacific Ocean and the neighboring valleys in the distance, as well as the mountains of the Monteverde Cloud Forest on the sides. 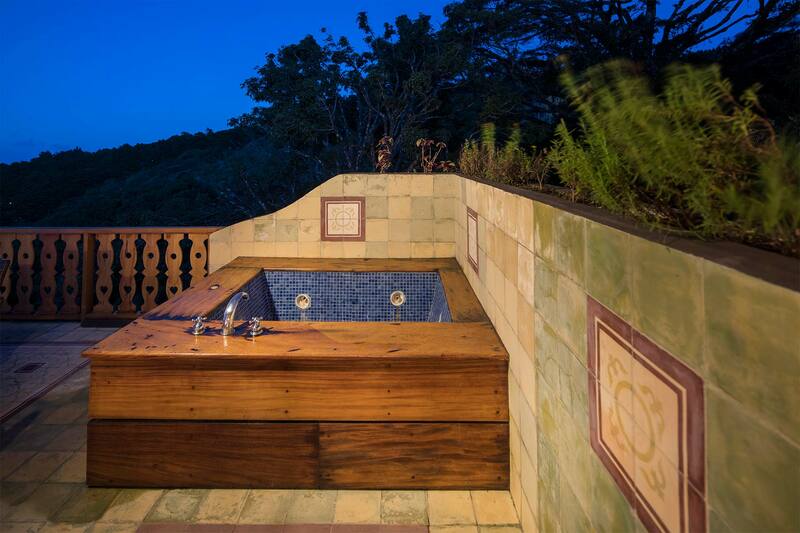 You will enjoy a grand terrace with an outdoor whirlpool Jacuzzi, as well as a spacious bathroom with a double vanity and shower. 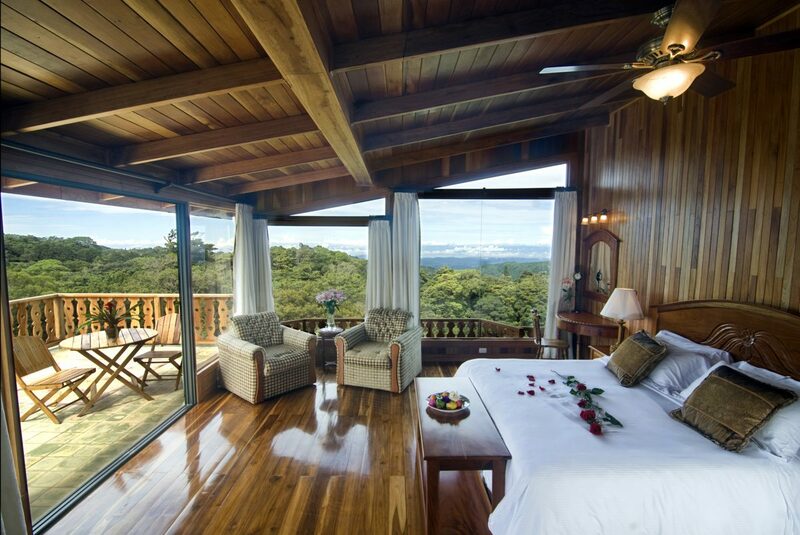 Our sunset room is the best way to relax and enjoy the spectacular natural surroundings of Monteverde. 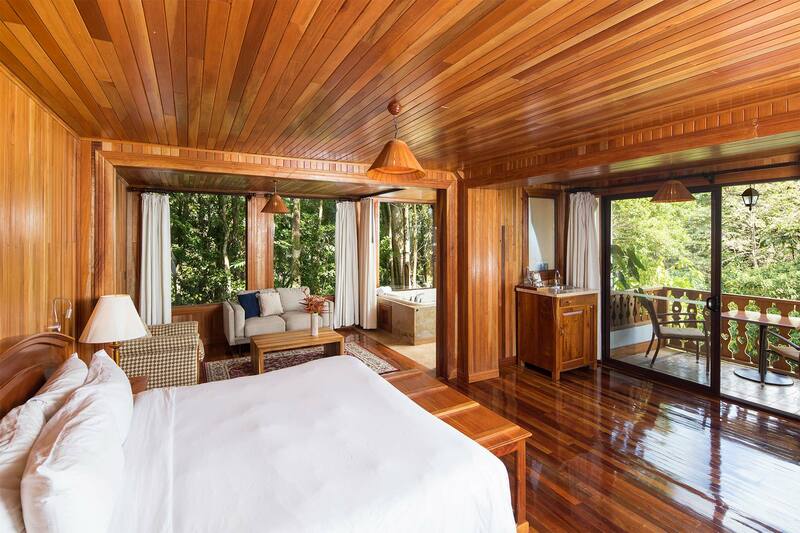 Equipped with a king size bed and daybed. 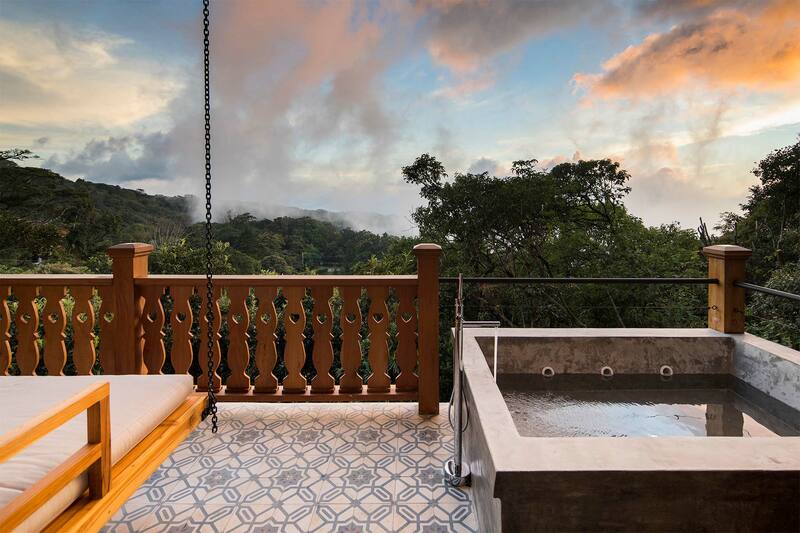 Offers 270-degree views of the mountains of the Monteverde Cloud Forest on one side and the Nicoya Peninsula on the other. 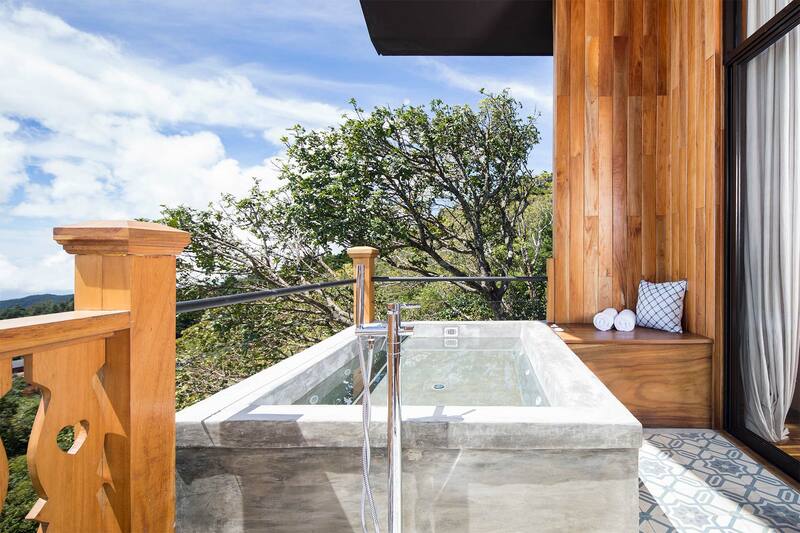 Enjoy an incredible bird-watching experience from your private 30m2 terrace, or unwind in your own two-person whirlpool Jacuzzi. 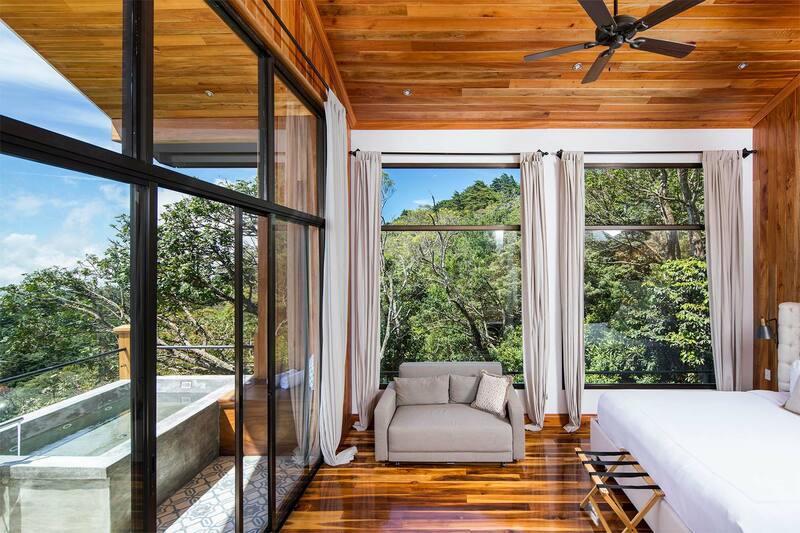 With floor-to-ceiling windows on all sides, this room offers some of the very best views in the entire hotel. 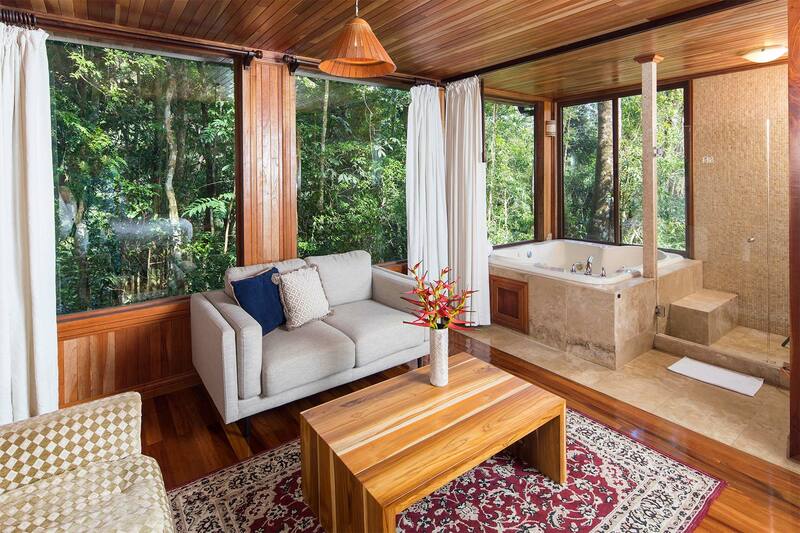 Includes a seating area and a large bathroom with a double vanity and large open-concept shower overlooking the forest. Note: Due to the topography of the Chalet and Suite buildings, we do not recommend that people with disabilities stay in these rooms. 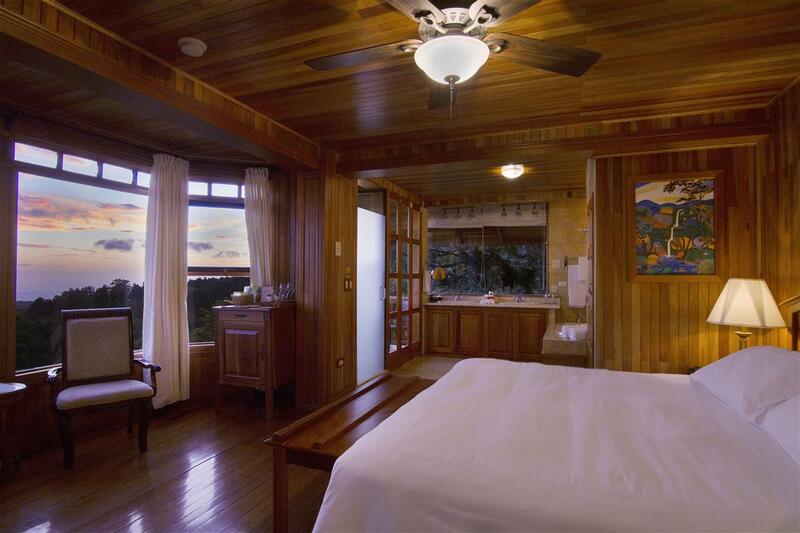 The rooms in the Principal building are more accessible and well-equipped. 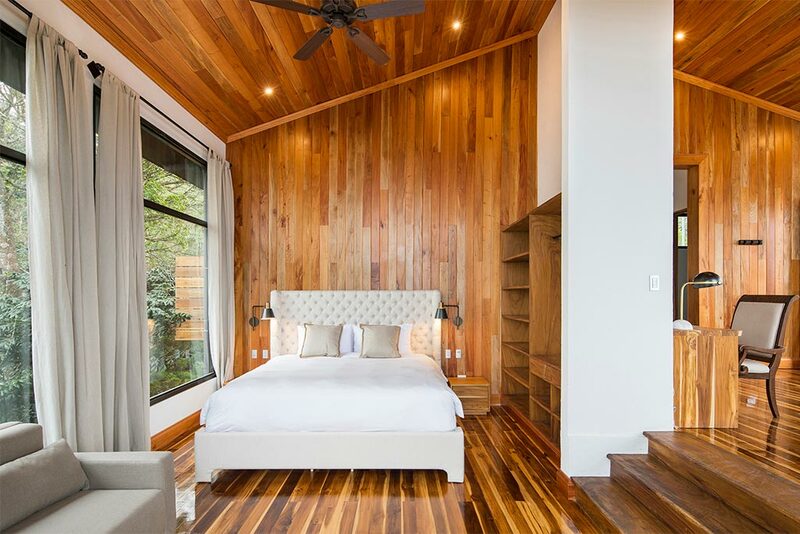 *Our Canopy, Belmar, Sunrise and Sunset Rooms also have a ceiling fan. 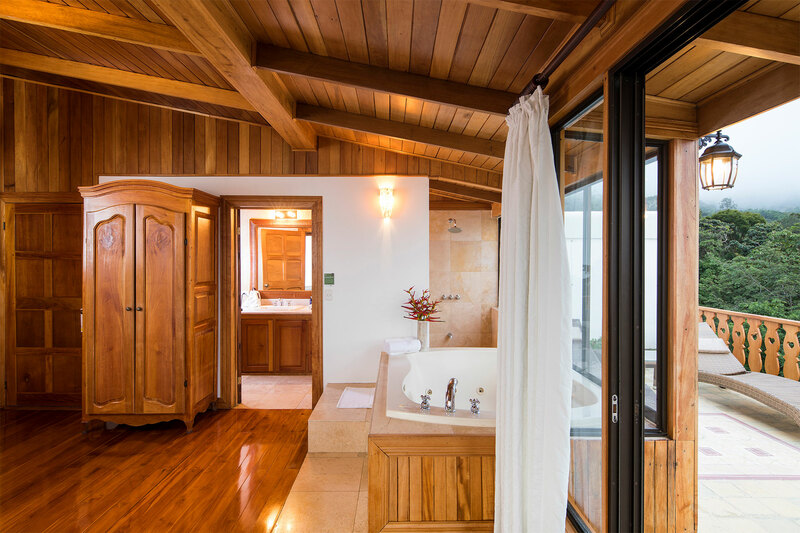 *To care for your health and that of the environment, all of our rooms are kept 100% toxin free. 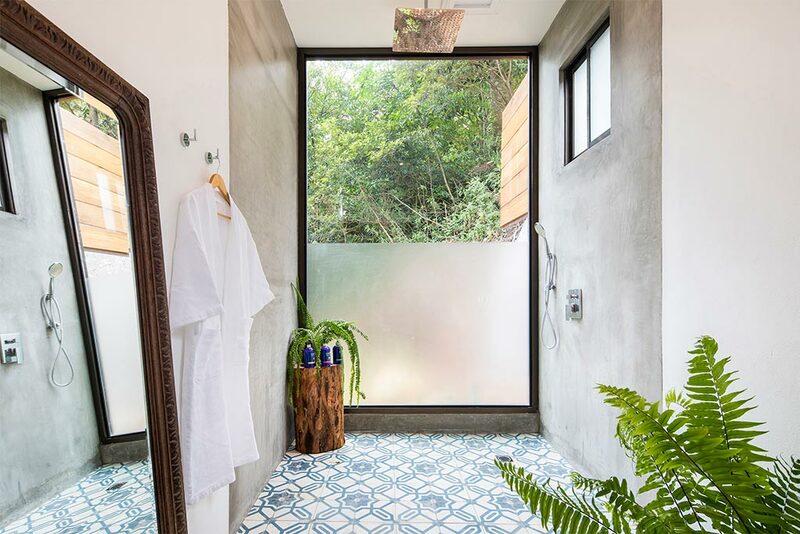 Products used to clean rooms, detergents used for towels and linens, and all bathroom amenities are gentle and biodegradable, all made in Costa Rica in harmony with nature. 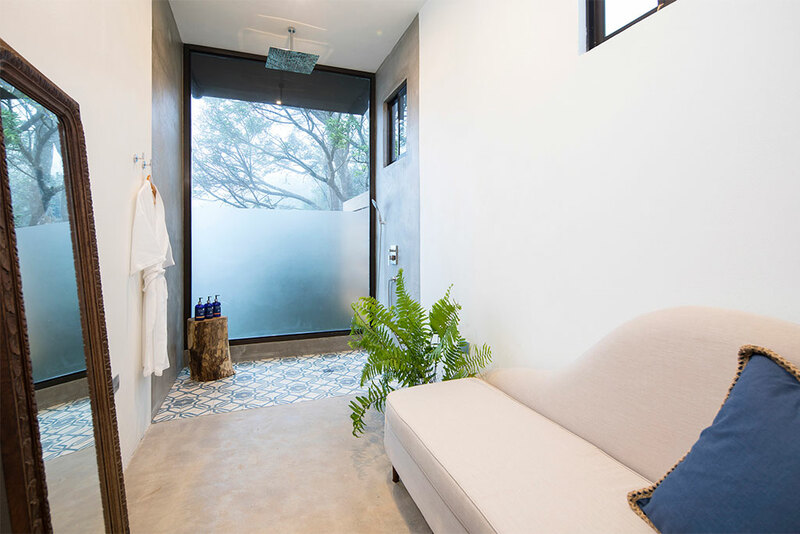 *Water in your bathroom, as well as that used in our laundry rooms, is heated with solar panels, thus considerably reducing our environmental footprint. **Please note there are no elevators in the hotel. Rates intended for double occupancy. Rates do not include 13% for taxes. 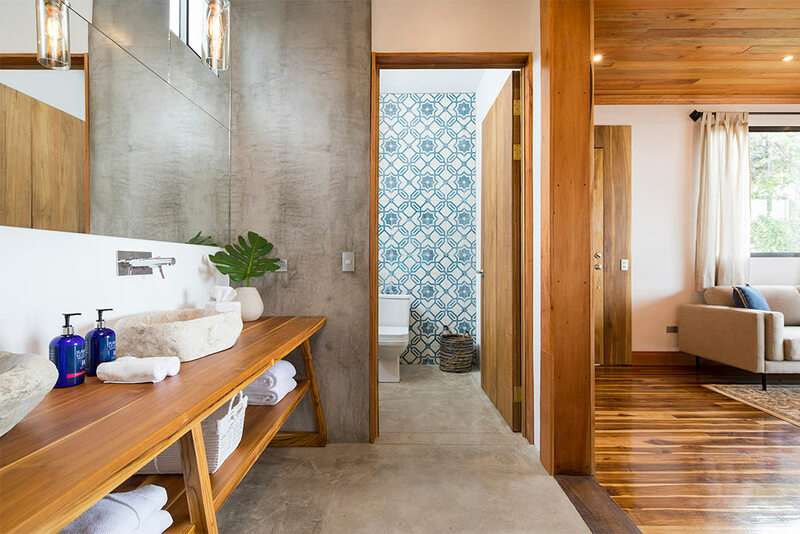 *Water in your bathroom, as well as that used in our laundry rooms, is heated with solar panels, thus considerably reducing our environmental footprint. It is also safe to drink. • High-quality plush linens (400 thread count, 100% Pima cotton). 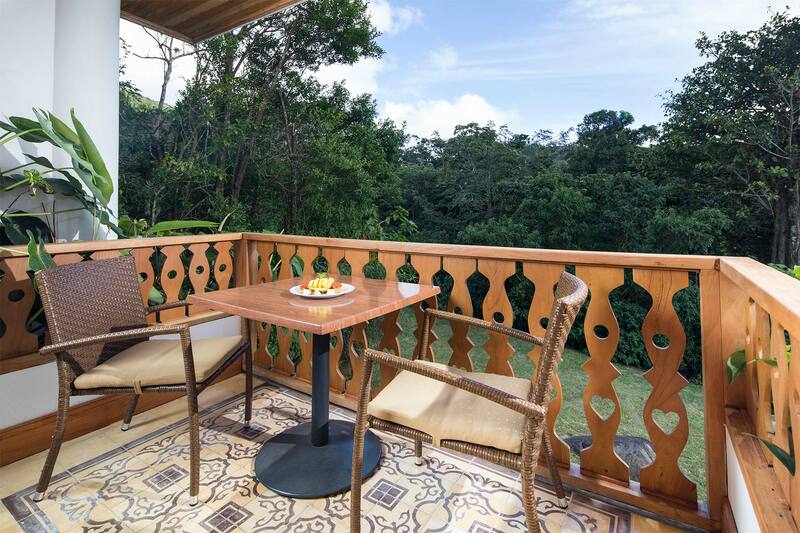 • Sitting Outside area with cloud forest views. • Cotton slippers and bathrobes. • Organic, handmade soaps, shampoo, lotion, and body wash.
• Private mini bar with local and craft products. • Local & International free calls from your room. Note: These rooms are located on a second and third floor walk up. Due to the topography of the Chalet and Suite buildings, we do not recommend that people with disabilities stay in these rooms. 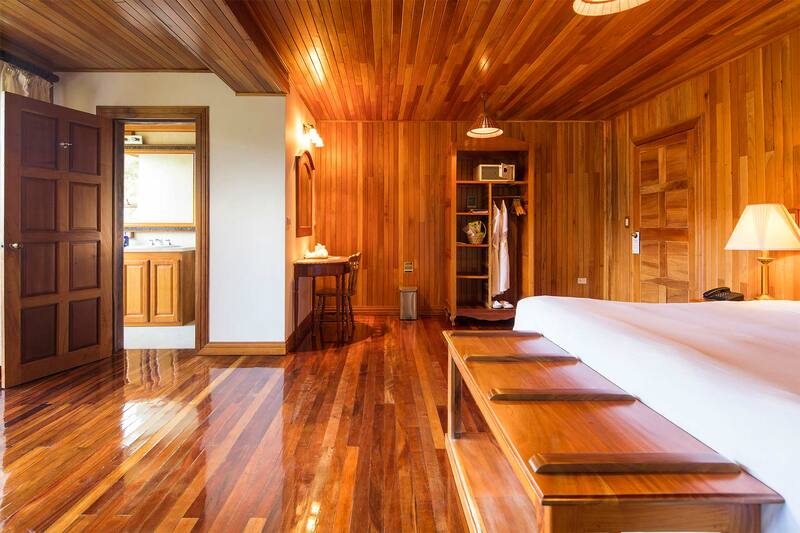 The rooms in the Principal building are more accessible and well-equipped. 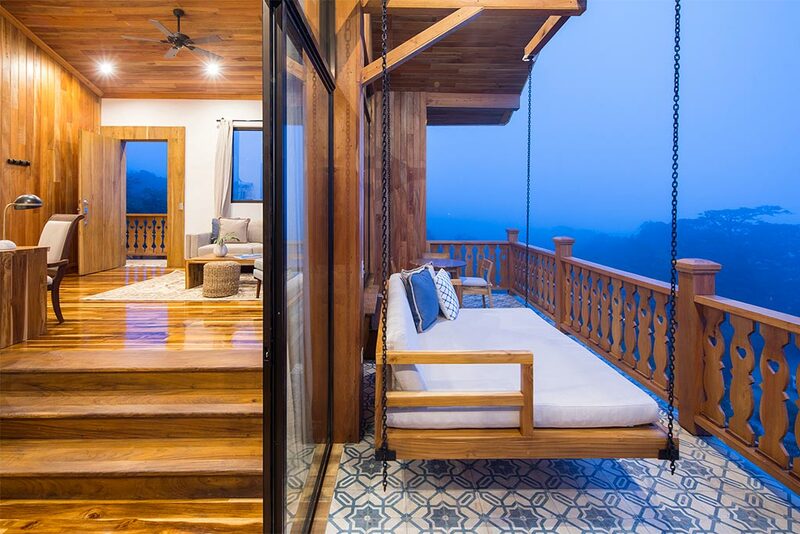 • Sitting Outside area with magnificent views. 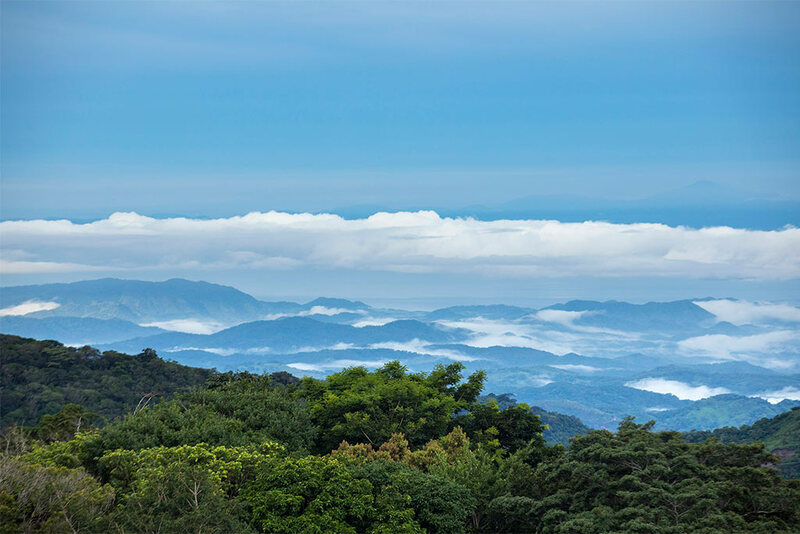 • All day, freshly brewed Costa Rican coffee delivery service. 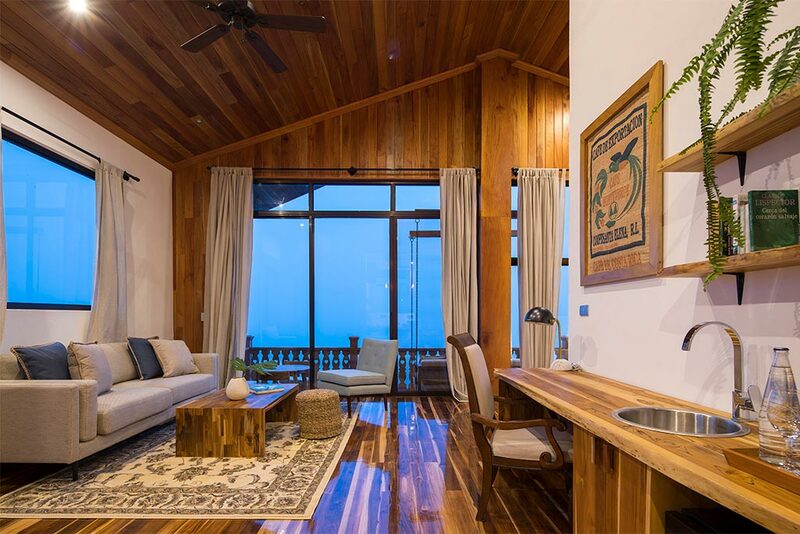 • One complimentary yoga classes during your stay in our Studio. Note: Located in a second floor walk up. Due to the topography of the Chalet and Suite buildings, we do not recommend that people with disabilities stay in these rooms. The rooms in the Principal building are more accessible and well-equipped. 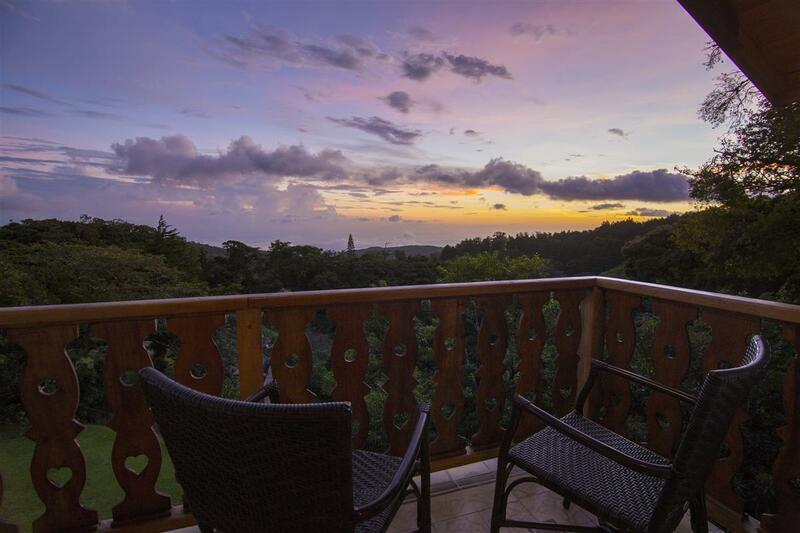 • Balcony with magnificent views. 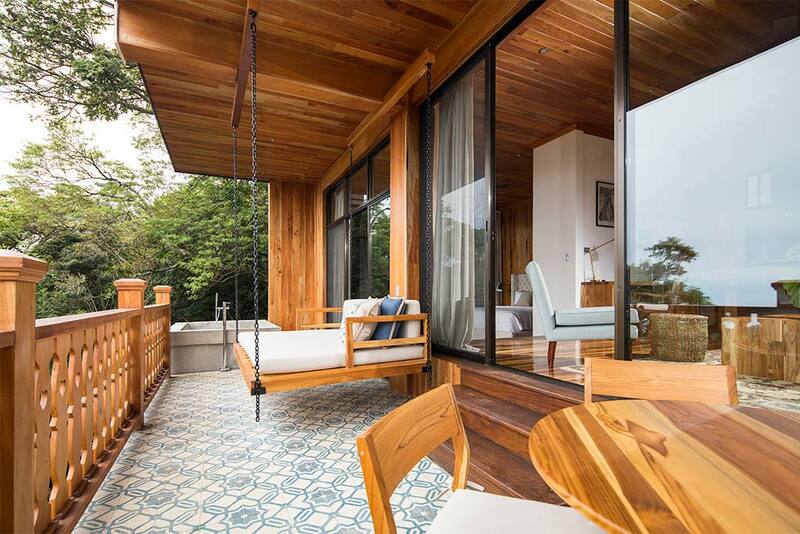 • Local & International complimentary calls from your room. 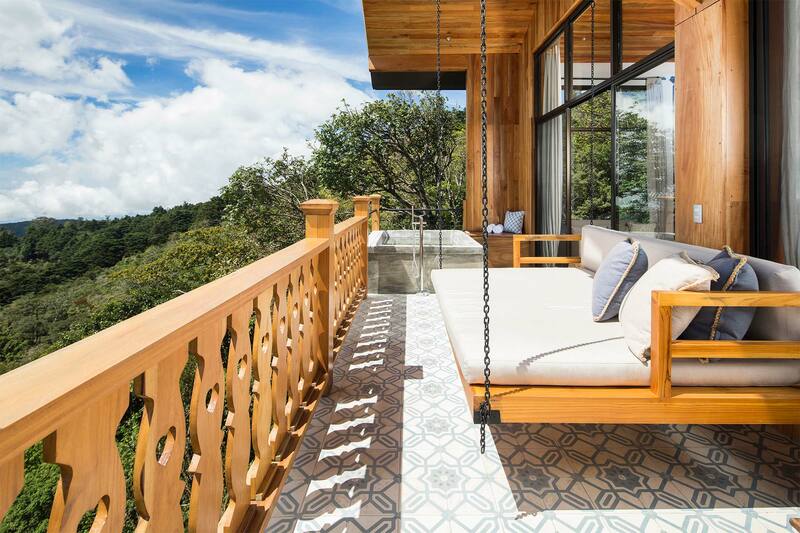 • Large glass covered terrace with hammock and seating. Note: Located in a third floor walk up. Due to the topography of the Chalet and Suite buildings, we do not recommend that people with disabilities stay in these rooms. 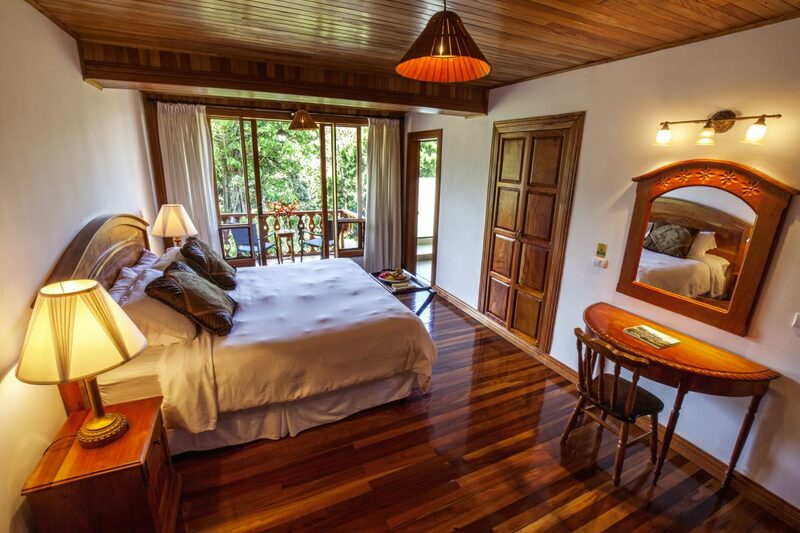 The rooms in the Principal building are more accessible and well-equipped. 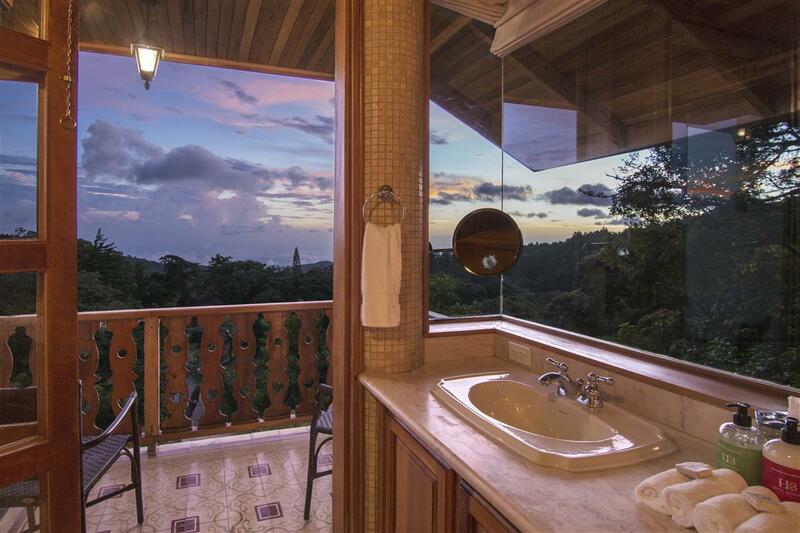 • Large terrace with magnificent views. 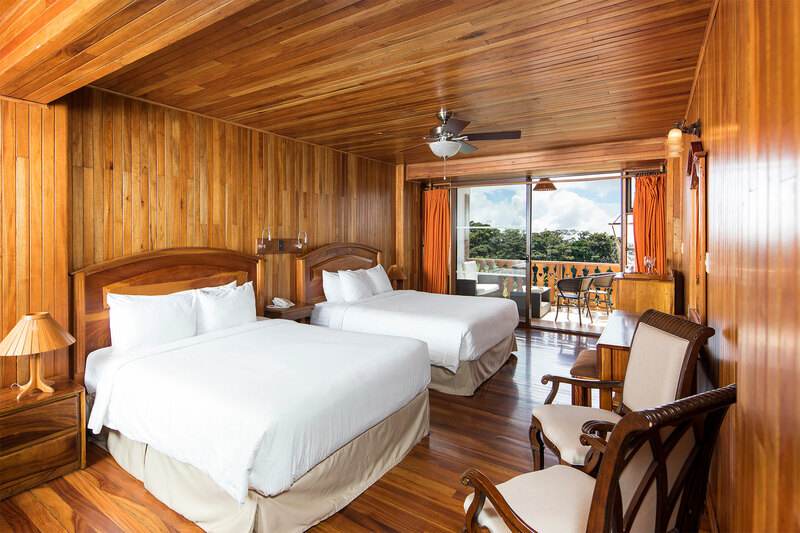 • Two queen size beds with high-quality cotton linens. 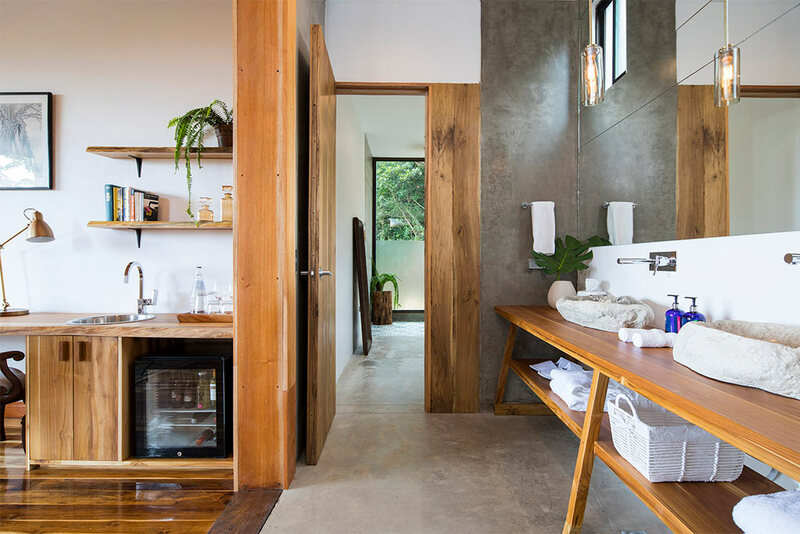 • Well-appointed minibar including organic, locally made snacks. • Hand made, organic soap and lotion, biodegradable shampoo and conditioner. • Telephone for free local calls and available international calls. 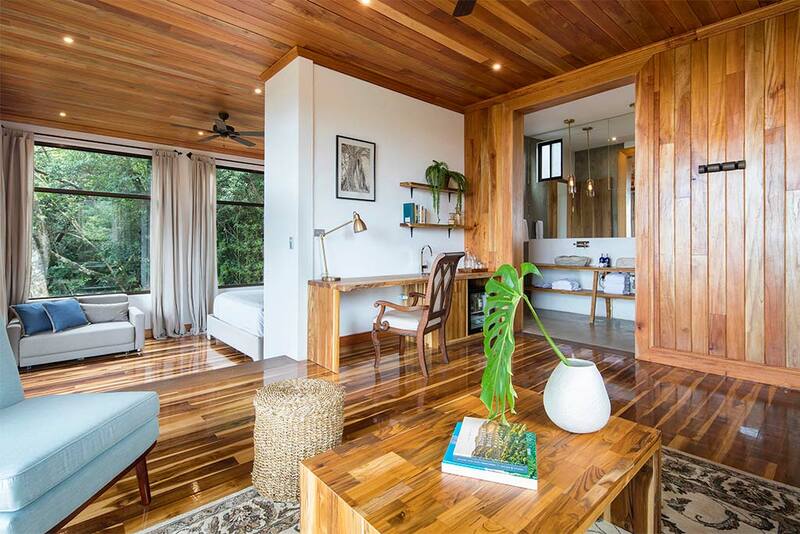 Handicapped accessible room and amenities available. Peninsula Superior Rooms are located on the top floor of the Main Building. 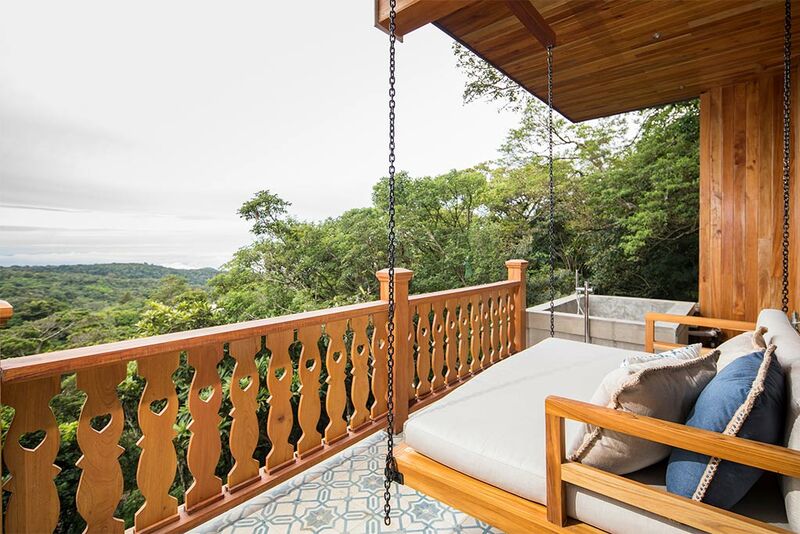 These rooms are ideal for couples, with private comfortable balconies with views of the Nicoya Peninsula and an open bathroom concept. 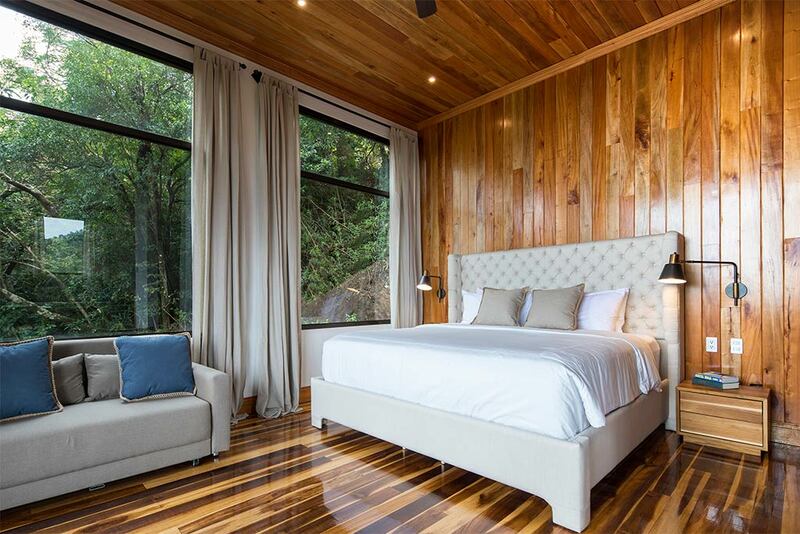 All rooms have a king size bed. Note: Located in a second floor walk up.